Previous Story: Why Do We Seek? Josh contemplated quietly what his father had just said. After some thought, he spoke again, “I can see why it is important to know oneself, Pa."
“Only that Ved has roots in a Sanskrit word Vid, which means to know or knowledge” answered Josh, “And that there are four Vedas. Rig Ved, Yajur Ved, Saam Ved and Atharv Ved." "All Vedas essentially comprise of the Mantras, which are the hymns, and the Brahmanas, which are the prose parts of the Vedas." “In his book A Critical Survey Of Indian Philosophy, the acclaimed scholar Dr. Chandradhar Sharma wrote that Vedic sacrifices needed four main priests or Brahmins to perform them - Rig for the Hota, Saam for the Udgaataa, Yajur for the Adhvaryu and Atharv for the Brahmaa." "The Brahmanas outline the rules and regulations for the performance of Vedic rites and sacrifices. Their name Brahmana is rooted in the word Brahm, which originally meant a prayer. Sharma wrote that there is little philosophy in these, so I never read up on them”. “Attached to these Brahmanas are Aaranyaks, which Sharma thought were so called because they were composed in the forests, as the Sanskrit word Aaranya means forest. He wrote that Aaranyaks mark the transition from the ritualistic to the philosophic thought, due to their mystic interpretations of the Vedic sacrifices." "The Mantras and the Brahmanas are called the Karm-Kand, as they are the ritualistic portions dealing with sacrificial actions. Aaranyaks are called Upasana-Kand or Worship-Section, as they deal with various kinds of worship or meditation." "The final portions of the Aaranyaks are called the Upanishads. They are also collectively called Gyan-Kand, as they are intensely philosophical and spiritual, and form the core of the Vedic Philosophy. But I have never actually read any of them before,” concluded Josh. “That is a good start,” replied Rosh, “Vedas do not talk about what is seen. They talk about the seer. They explain Nirgun Brahm, the fundamental nature of being and the world that encompasses it. So they are a study in Metaphysics (from Greek meta, meaning beyond, and physics signifying the physical world you see)." "Vedas were insights revealed to the great ancient Rishis of India. More than a century ago, Monier-Williams, in his Sanskrit English Dictionary, suggested that the word Rishi means a Seer (from Sanskrit word dris, to see), a Mover (from Sanskrit word rsh, to move)." "Modern etymological explanations, such as by Manfred Mayrhofer in his Etymological Dictionary, however connect it with the Avestan word arasis and the German word rasen, both of which mean ecstatic, to be in a different state of mind." "So, those ancient Hindu Rishis were the Mantra-Drashtas, seers of Mantras and insights. Legend says that these direct intuitional revelations are Apaurusheya or superhuman. Because they were not created by any human effort, they do not have any author." "Rishis saw these truths. They did not invent them. They were their spiritual discoverers. And they passed on this knowledge through generations by the spoken word. Since the Vedas were heard, they were called Shruti, (Sanskrit roots again, meaning hearing or listening, and spelled sruti or sruthi in South India)." “Upanishads were esoteric teachings given confidentially (rahasya) to meritorious students after they had undergone an appropriate period of preparation in life. In his book Outlines Of Indian Philosophy, the renowned scholar M.Hiriyanna says that etymologically the word means ‘sitting (sad) near by (upa) devotedly (ni)’." “The Principal Upanishads technically constitute the concluding parts of the Brahmanas. However, they tend to take a life of their own because of their distinctively philosophical quality. The philosophical tendencies implicit in the Vedic hymns get explicitly expressed as a search for reality in the Upanishads." "There are said to be over 200 Upanishads but only about a dozen of them are considered major philosophical works. 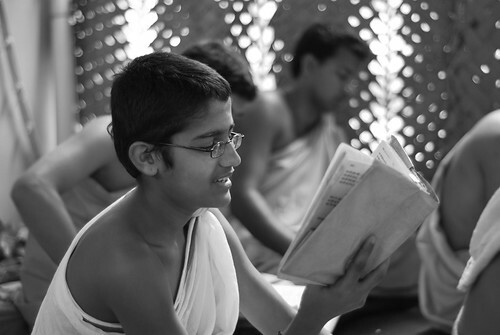 The Muktikopanisad gives the number of Upanishads as 108. About a dozen, on which the famous Shankaracharya (acharya means teacher) has commented, are considered to be the principal ones." “The first Vice President of India, Dr. S. Radhakrishnan, who also later became the second President of India, wrote in his book The Principal Upanishads, that Chandogya Upanishad belongs to Saam Ved. It is a part of the Chandogya Brahmana, which has 10 chapters." "The first two chapters of the Brahmana deal with sacrifices and other forms of worship. The other eight constitute the Chandogya Upanishad. The first and the second chapters discuss the problems of liturgy and doctrine, such as the genesis and significance of OM (or Aum) and the meaning and names of Saman." "Onwards from the third chapter, he says, are introduced the concepts of Atma (Soul) and Brahm (the thing-in-itself), and their inter relationship. Tat tvam asi is the sentence spoken by Uddalaka in an attempt to bring his son to the knowledge of Brahm in the Chandogya Upanishad." With that Rosh turned around on the path, and with his son began the trek back home. Stars twinkled mischievously in the sky then shone brighter at the promise. Note: Click on Info at the top of this page, and then on Names tab on the Info Page, for an explanation of naming conventions used on this site.